Don’t let a red wine spill spoil your party. Quickly remedy the accident with one of these three easy solutions, and follow with a toast to stain-free carpeting and upholstery! Inevitably, there’s at least one unwelcome guest at every holiday party: the red wine stain. Sure enough, just as everyone is sipping, swirling, and savoring their favorite vintage vino, trading stories and seats over the course of the evening, it happens—someone spills. Lucky for you, the sooner you clean up the drink, the less chance it will stain. A wet spill is always easier to clean than a dry one, so think fast and act faster. Always blot up all you can before it soaks in (no rubbing allowed! 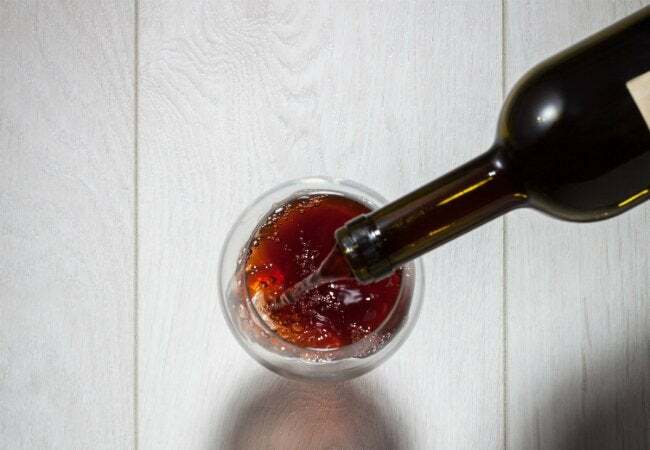 ), then follow with one of these three handy solutions and you’ll be raising your glass to toast to the fact that your carpet and upholstery are spot-free. Sometimes, the solution is hiding in plain sight—this time out on the dining room table. After carefully removing the excess liquid, first pour an ample amount of cool, clean water over the affected area to dilute the concentration of the red wine. Next, grab the salt shaker. You’ll need more than a sprinkle, so twist off the top altogether and pour out a small heap over the entire stain while it’s still wet. These crystals should absorb the wine and turn pink over the next several hours. To get the maximum benefit of this tried and true technique, leave the salt pile in place to dry overnight. In the morning, scoop up the salt and discard the pink crystals into the trash. Then, vacuum away any remnants that may still embedded in the carpet or upholstery fibers. Once you’re finished, the stain should be much less noticeable, if not entirely gone. 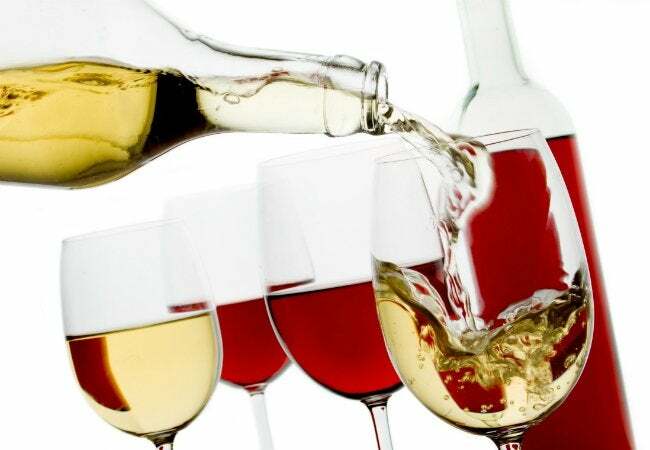 As backwards as it sounds, a splash of white wine over your existing red wine stain can dilute the concentration much like adding cool water would—reason enough to uncork that next bottle! Once you pour the white, dab at the area with a clean cloth to soak up the mixture. This should remove most of the stain. If not, follow up with a homemade remedy straight from the pantry: an absorbent baking soda paste. Mix up three parts water and one part baking soda, coat the stain, and leave it overnight to soak. To ensure effectiveness, also cover the area with a clean cloth and a heavy book. 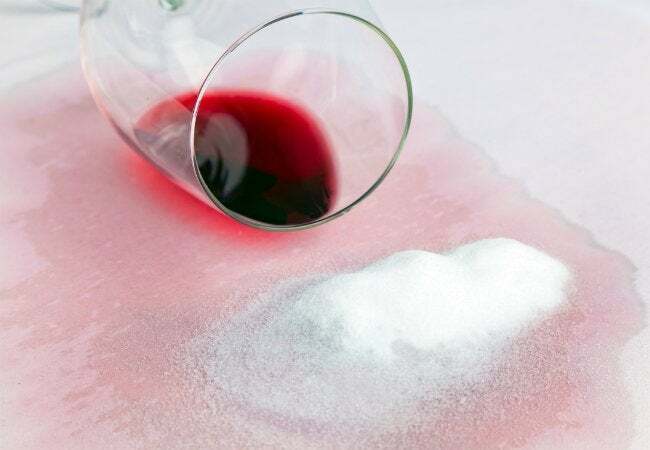 The weight of the book will help press the powdery mixture into the fibers to pull up any wine that remains, and by morning you can scrape off that caked-on crust to reveal a stain-free surface. Good for more than just sterilizing skin cuts and scrapes, hydrogen peroxide also makes an effective cleaner for red wine stains. Just remember: It is a mild bleaching agent, and therefore not for use on dark carpets or upholstery, only lighter materials like white carpet. Mix one small squirt of dishwashing soap with half of a cup of hydrogen peroxide in a shallow dish. 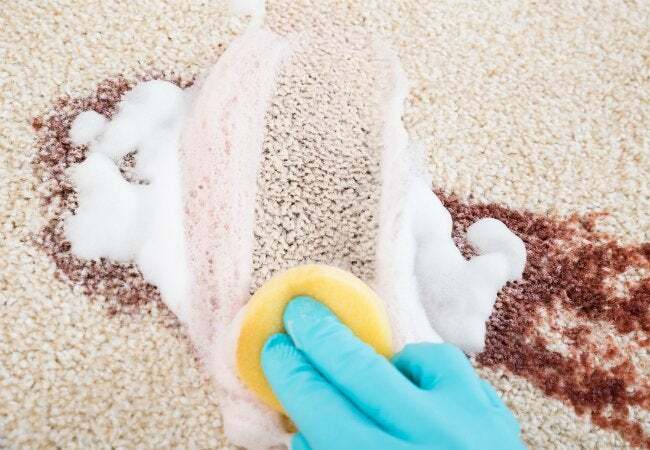 Start by testing a small amount of the solution in an inconspicuous spot on the carpet or furniture before inadvertently creating an unwanted bleach stain. If the area bleaches, or you notice a dye transfer, then dilute the area with water, dab away the moisture, and discontinue this method. If there is no discoloration, soak a clean cloth in the soapy peroxide solution and dab at the stain. Blot gently, allowing the mixture to seep into the fibers. Repeat this process until you’ve applied the solution to the entire stain, and allow the mixture to stand for a few minutes for the best results. Once the hydrogen peroxide has done its job, wash and rinse it away. Fill a clean spray bottle with cold, soapy water and lightly wet the stained area. Blot with another clean towel, this one soaked in fresh, lukewarm water (no soap). Finally, when you dab the spot with a dry towel to absorb any excess moisture, the stain should have wholly disappeared.